Under the developer name of Reliance Jio Messaging Services Private Limited, Mukesh Ambani-owned company has launched its messaging application for free. 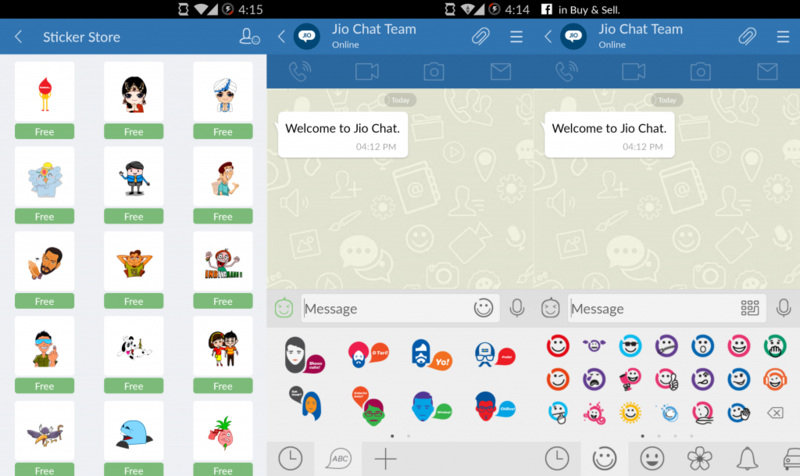 For the moment, Jio Chat app is available for Android and iOS platform under the Communication and Social Networking category, respectively. There is no single paid feature offered within the app while it covers almost all popular features on messaging platforms like conversion, voice call, video call and different Channels. We already have dozens of options available when it comes to messenger applications and yesterday itself, Facebook rolled out desktop version of its Messenger app. In this competitive era, its hard to find a unique space for a messaging application but scope is still there for better ones. 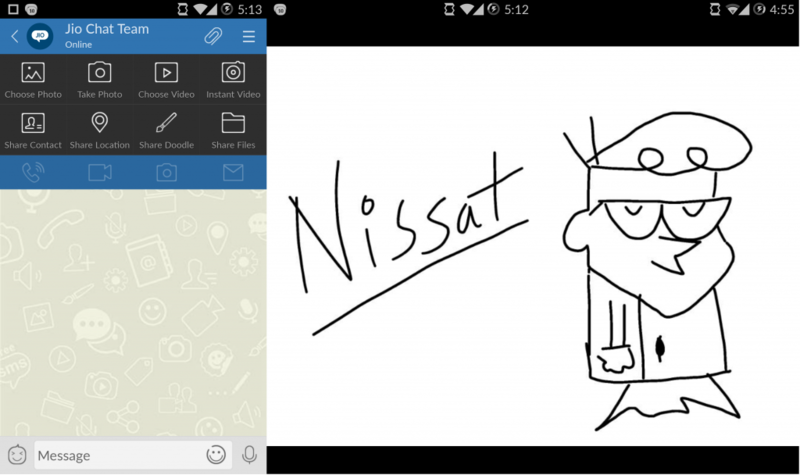 During my initial usage, it impressed me by working just like any other good messaging app I have used in past. The very first part is its installation and setup. Since we are talking for Android and iOS platforms, so we just need to click on an ‘install’ option in the respected app stores. Let me now start with my complete review. The app sizes 20MB and it won’t take long to get ready. Once installed, enter your phone number (which will, of course, act as a profile ID) which will be automatically confirmed by a text. Once ready, you can enter your name, add a profile picture and you’re ready to go. Just like WhatsApp or Telegram, it imports contacts right from your device and showcase them. You’ll come to know if a person in your contact list is using Jio Chat or not. If not, you can even invite him/her by clicking on an option labeled there. It will then send a text invite to the person, which won’t cost a dime. Conversation window was looking like as of Hike while still maintaining a simplicity. Sending texts and sharing pictures and videos was pretty easy. A sticker store is already built-in with lots of sticker package available. Emoticons are also supported within. Apart from normal texts, I was allowed to record and share voice notes as well. I really liked the Doodle feature and I won’t be a spoiler for you here. Try it out, it’s cool. 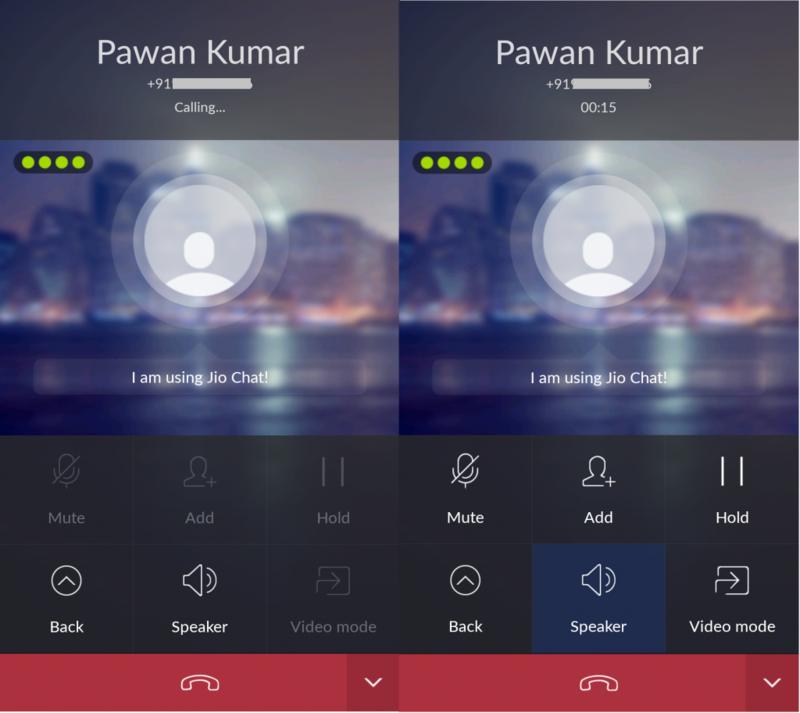 A calling option is already there using which either a voice call or video call can be made, depending on the device specs and network speed at your end. I tried both and found them just good. If you’ve already tested WhatsApp calling feature in our country over the normal 3G network, then you can understand the quality of voice call I’m referring over here in respect to Jio Chat. There was always a noise in the background and even I forget that it’s not a phone call, I was aware of it. Still, the app is featuring good standard, not to forget its just starting at the moment and I wish to experience better improvement later (of course, if I’ll use it in future). When I said, the app isn’t offering any paid feature, I didn’t mean it completely. A Channel section is there that recommends certain offers and applications. For users, it depends on whether the app is free or paid but app developers are going to use it as monetization tool. Users are even allowed to follow their favorite brands and celebrities right through the Channels. Other features I missed referring above were location sharing, unique user interface (I won’t call it elegant, but it is simple) and offline chat. The offline chat works on the formula that you’re allowed to send messages even if internet connectivity isn’t there and those messages will get save in draft. Later, with the availability of internet connection, those drafts will proceed. Who needs a new messaging app? If you said yes (or even gave it a glimpse), then try Jio Chat. To be honest, Jio Chat has to offer strong reasons for us to start using it as our primary messenger. Yeah, just like WeChat or Hike, or may be something different. See you in the discussion. Peace. Try following the link I’ve added above that will directly open the app’s page in Play Store..
Alos, search with this name, ‘Jio Chat’ and you’ll find it..
Hello I can see jio chat from ur website but they said u can’t download in ur country because I m in south Africa so now please tell me can I download in south Africa? The app is currently live for Indian users only. But you can stil install it and see if its services are live in foreign countries or not. Do inform me about the status. You still have an alternative way but its little bit long (just a little bit). Follow the steps as I’m writing below. You can use this APK Extractor (Online) to get the Reliance Jio Chat APK file. To do that, copy URL of Google play store listing of the app (the one I’ve added above, here it is again), paste the URL in the APK extractor tool and then the Jio Chat APK download will begin. Once downloaded, transfer this file to your Android device. Pick your smartphone, move into Settings and there enable ‘Unknown Sources’ named option under Security tab. Once this option is enabled, then launch File Manager app, find the Jio Chat APK and tap on that. Now click on ‘install’ option and the app will be installed at your device within few seconds. Sorry about that and really thanks for sharing your views again with us. It will not only help me, but it will also help our readers to update their knowledge about Jio Chat messenger application. 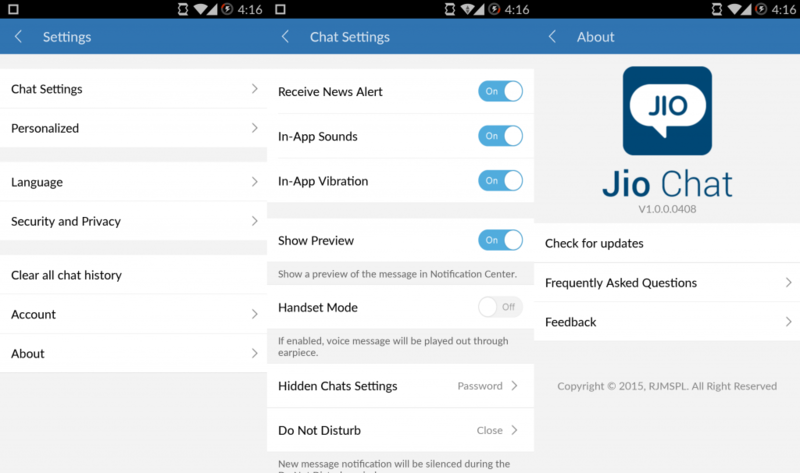 Jio Chat release date in other countries isn’t confirmed yet. So it will not be correct giving a date without official words. But I do feel one thing that this app may not be available for the rest of the world. I feel that because Reliance Jio is an upcoming cellular network provider (which is all set to launch its 4G service in India) and this app looks just a part of that to me. So, it won’t be a big surprise for me if it doesn’t get launched globally. Wait for a while and the app will be available for BlackBerry OS as well. The only case it won’t reach that platform, is if Reliance isn’t serious of this app’s future. I do hope that Jio Chat for BlackBerry arrive soon. Between, which BlackBerry device you’re using? I have downloaded Jio chat app through Google play store and installed it, however, after installation I gave my number for Sms verification and I never received the code. This has happened happened many times as I installed and uninstalled the Jio app to get the verification code. Also, I read the public review and I could see this a common issue.. please fix this issue.. thanks in advance. Sorry for the inconvenience you’re experiencing. When I tested the app then SMS came almost instantly and there wasn’t any delay in the same. I’ll try it again and see if it’s occurring at my end as well. But even if it occurs at my end, then also I can’t help fix this issue. That’s because the app is developed by Reliance developers and only they can fix the issue. Still, there is one thing you can do. Go to Google play store listing of this Jio Chat application and write a review there. In that review, mention the issue you’re facing i.e. not receiving verification SMS. I hope the developers look into the matter ASAP. Also, which phone you use? A high-end or budget Android smartphone?